Enzo Maccarinelli begins his quest to rule the cruiserweight division on Saturday against American-based Londoner Ola Afolabi in Manchester. The Welshman starts his road to boxing redemption following defeat to David Haye as he fights Afolabi for the interim version of his old WBO crown. And Maccarinelli's long-term sights are on a unifying bout with Polish IBF champion Tomasz Adamek. The 28-year-old boasted: "I don't see anyone out there who can bother me." 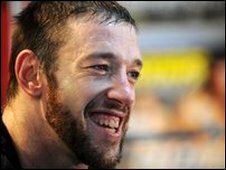 Maccarinelli is "sick and tired" of the criticism he has received since being blown away by Haye at the O2 Arena a year ago. He lost his belt when Haye destroyed him inside two rounds in their unification showdown in London last March. Haye has since moved up to heavyweight while Maccarinelli has endured what he describes as a "ridiculously frustrating" 12 months with only one tune-up fight to keep him busy. Do you expect an easy Enzo Maccarinelli victory? The Swansea showman had hoped to face Johnathon Banks for the belt last year but the unbeaten American pulled out twice - before losing to IBF champion Adamek last month - to leave Maccarinelli temporarily in the cold. With only a quick stoppage of Matthew Ellis in December since the Haye fight, Maccarinelli is raring to go. "It has been ridiculously frustrating," Maccarinelli said. "But I showed my mentality that night in December. "I had three changes in opponents that week and I did get the offer from Frank Warren that I could have just gone home, but that's not my mentality. "They ended up giving me a heavyweight, Matthew Ellis, and unfortunately for him he bore the brunt of my frustration." The WBO title picture is cloudy, with Argentine Victor Emilio Ramirez the current outright holder. Should he beat Afolabi, Maccarinelli would be in line to face the Argentine or take the full title if Ramirez fails to defend his and is stripped of the crown. Maccarinelli hopes to then unify the belts by facing Pole Adamek. He said: "The good thing is Adamek has brought himself forward as the front-runner, he is the number one so it's nice to have something to aim for. "I spoke to my promoter Frank Warren and obviously I want to fight the best. "I'm sick and tired of getting criticism off people and the way to handle that is by showing them I'm willing to fight anyone and I want to fight anyone." Afolabi is an unknown quantity in Britain but Maccarinelli is taking heart from what little he has seen. "I've seen a video of him," he said. "I don't know too much about him but what I do know is he's a good fighter. "He makes a lot of mistakes but the guy I saw him fight wasn't up to scratch and he probably took a lot of risks that he wouldn't take against anybody else." Maccarinelli added: "I feel like a man possessed at the moment and I'm ready to rock on Saturday night." The bout is on the undercard of the Amir Khan-Marco Antonio Barrera bill.